Why are those paper toilet seat covers never the right size for the toilet seat? And what are we supposed to do with that middle section? Why are those paper toilet seat covers never the right size for the toilet seat? And what are we supposed to do with that middle section? We're supposed to tear along the perforated lines before using...right? The annual Philadelphia Mummers parade. How come they don't sell a line of Mummers clothes? "Want to go to the parade, hon?" "Nah. They ignore my cries for help." New for 2015: Mummerwear© for Him. 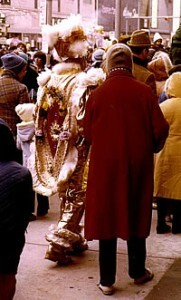 Don't just watch the Mummers, now be a Mummer. Get Mum now. And stay Mum forever. Yes, I did mean that as a threat. H.G. Wells (Paul F. Tompkins) welcomes F. Scott Fitzgerald (Andy Daly) and James Joyce (Sean Conroy) to the Dead Authors stage. Appendix G: From the vaults! H.G. Wells (Paul F. Tompkins) welcomes F. Scott Fitzgerald (Andy Daly) and James Joyce (Sean Conroy) to the Dead Authors stage for an evening of whatever this is. The podcast is free — so far — but proceeds from the live performances help 826LA, a non-profit literacy program. - It's for my collection! - Did you put on sunblock? - I thought my sneakers would cover that part. - Okay, that's the worst. - It's a local beer made entirely of blueberries, pine needles, and sunblock. - He can sleep under our bed. He doesn't make that much noise, if he's been drinking. - You're not keeping that thing. We're taking it back to the gift shop right now. - I forget which one I got it from. - We won't know if it's infected until you do laundry. - These little towns must be adorable in the winter. - Lady, it's a hellhole in January.